London: William Heinemann, 1951. First Impression. Hardcover. Fine-/Near Fine+. First Issue, without the divisional numeral (and thus chapter division) of Book 2, VIII. 8vo: ,237,pp. Publisher's grey cloth, spine lettered in gilt, biege end papers, grey and white price-clipped typographic dust jacket. About Fine (mild lightening to spine); about Fine jacket (several miniscule closed tears). A most attractive copy. Wobbe A27a. 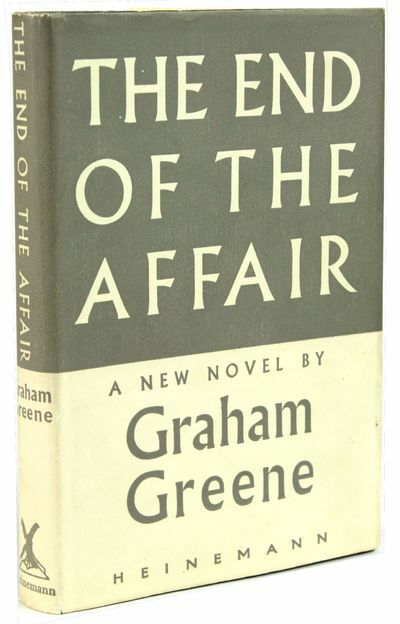 In the introduction to this novel in Introductions to Three Novels, Greene reminds the reader that The End of the Affair was one of his first attempts to use the first person. He also reports that Great Expectations and The Good Soldier were deeply influential in the novel's development. "From a technical standpoint, [The End of the Affair] is a masterful blend of diary entries, letters, and shifting viewpoints, yet from a religious standpoint, it is the most spiritually challenging record of obsessive jealousy and hate that Greene ever produced . . . The fourth of Greene's explicitly Catholic novels, [it] in fact concerns a love triangle. It is also a kind of detective story, in which the mysterious third party, of whom Bendrix is so jealous, proves to be spiritual. Greene dedicated the novel to 'C.' [Lady Catherine Walston], with whom he was then having an affair." (Literary Encyclopedia) Note: With few exceptions (always identified), we only stock books in exceptional condition, with dust jackets carefully preserved in archival, removable polypropylene sleeves. All orders are packaged with care and posted promptly. Satisfaction guaranteed.